Hello Friends! We’ve been enjoying some wonderful weather here, and we have been working in our garden which I will share all of that with you later. But today, I want to show you my Easter tree. There is nothing like some sunny weather to put you in the mood for some spring decorating, is there? So I pulled out my storage bins and my scrappy little tree that my friend had given me back in the fall. And do you know what I did? I spray painted it white!!! I will have to admit that it took a can and a half of paint to cover all the green on this tree, and between all the drying time that I gave it, it took me about 3 days to turn that green tree into a white one! Every time I would look at it and moved the branches just a bit, I would see some green. And in the photo, you can also see a little spot that I missed. So I guess that means that I will have to give it another shot of paint when I take off the decorations! But isn’t it pretty in white! 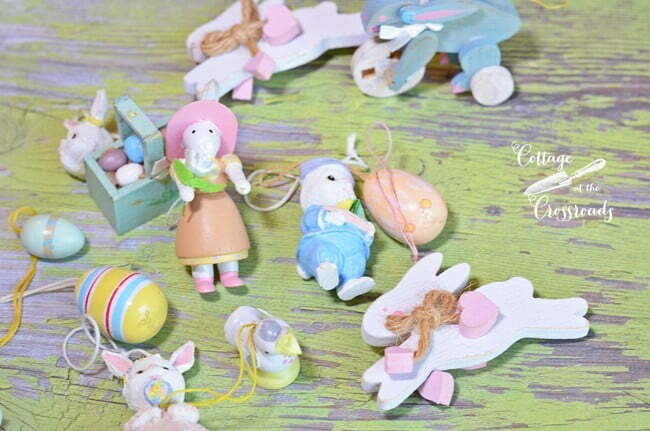 Next I pulled out these Easter tree decorations that I’ve had for more than 25 years or so. 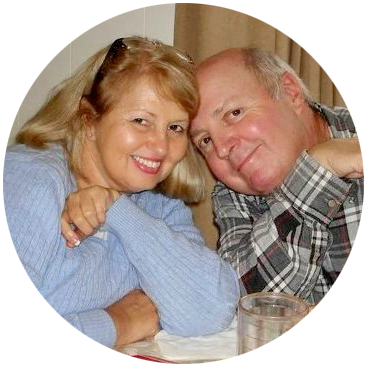 You see, when I was teaching school, I always put up a Easter tree in my classroom, although I had to call it a spring tree. The children always loved to help decorate the tree. 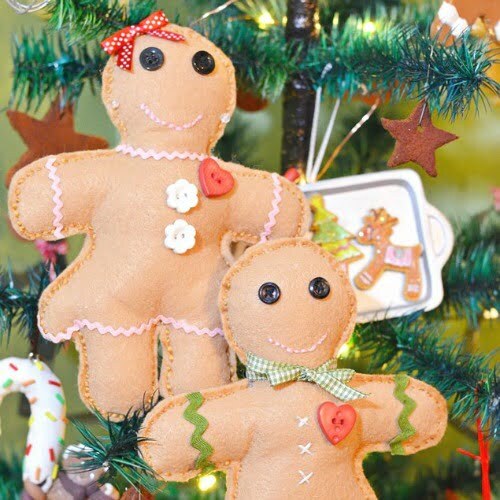 You may remember seeing some of these ornaments when I used them to decorate our SPRING MANTEL a few years ago. Since this tree is a little larger than what I usually use, I felt like I needed a few more ornaments. 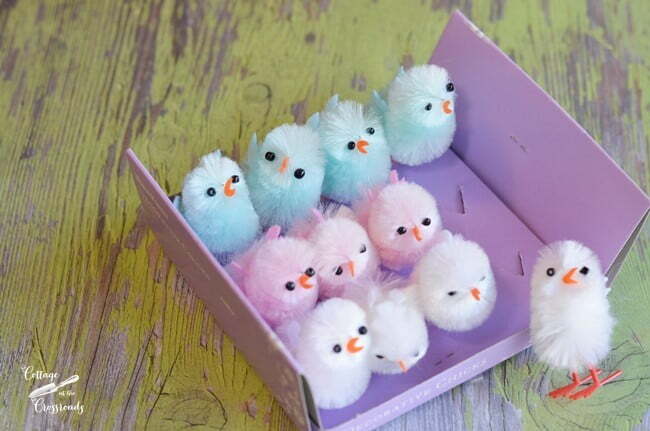 Lucky me when I ran across these little chicks at World Market. 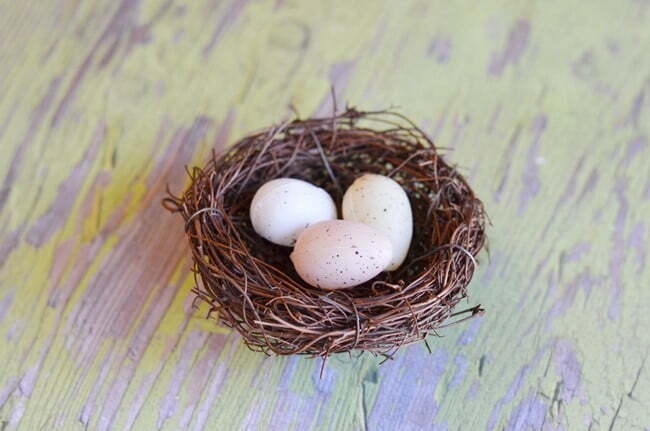 I already had a few of these nests with little eggs glued inside that I thought I could add to the tree. 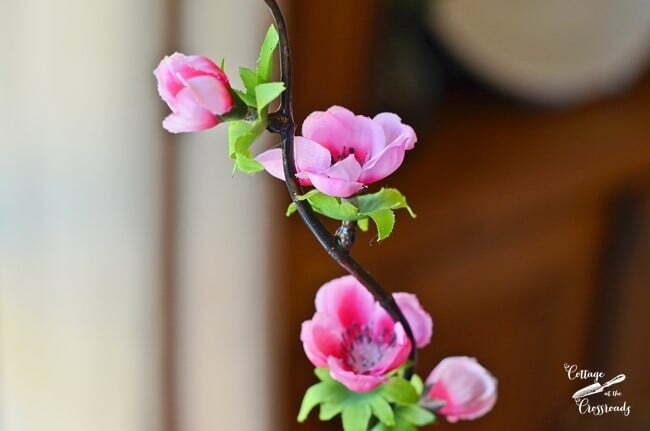 In my stash, I ran across these faux quince blossoms that I thought would add a lot of spring color to the tree. 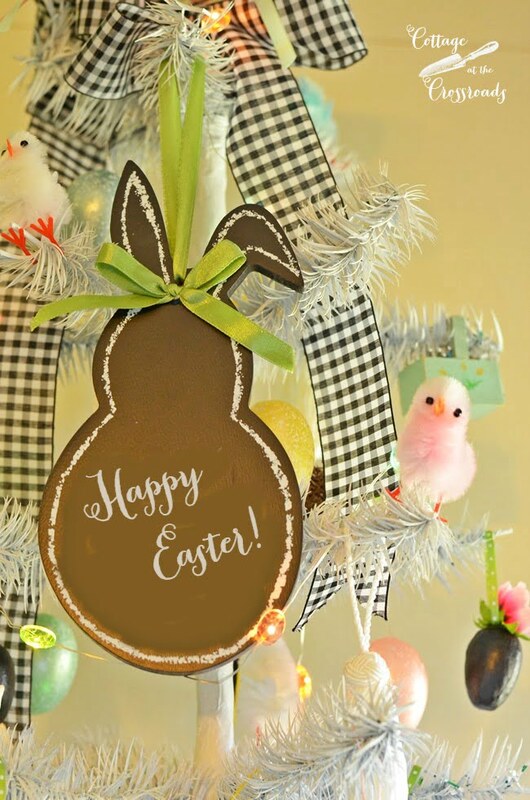 And since I planned to use the Easter tree in the kitchen where I have a green and black color scheme going on, I spray painted some cardboard eggs black! Yes, black! What creature lays black eggs, I thought to myself after I had painted them!!! What I found out was that there are a few ducks and emus that lay dark colored eggs. Who knew??? 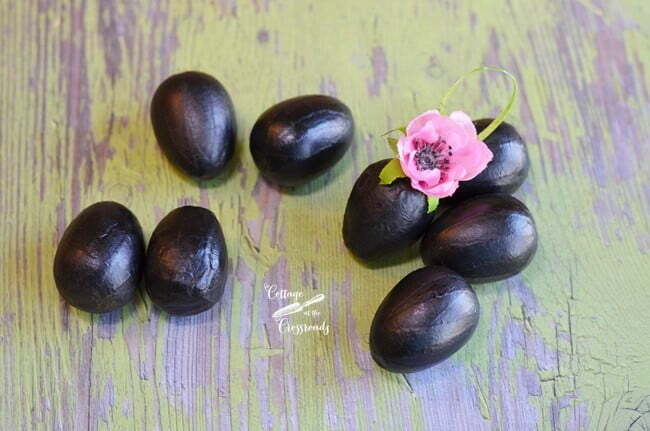 As you can see, the quince flowers ended up on some of the black eggs. 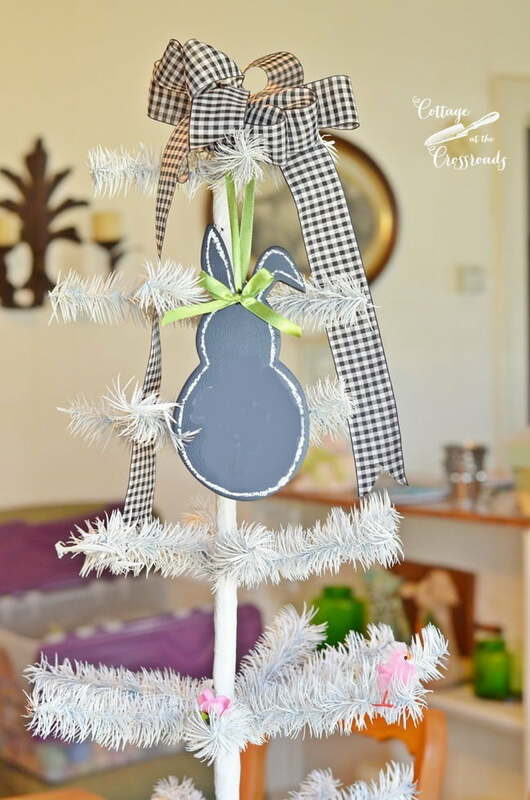 So I started decorating the tree by adding the black and white checked bow, a small bunny chalkboard ornament, and some of the little fuzzy chicks. Oh, my gosh! 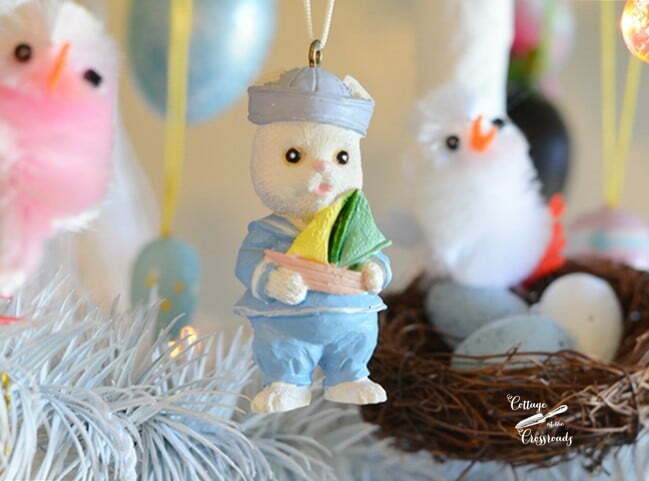 I was having so much fun putting on some of my favorite ornaments that I’ve had for years like this little bunny holding his sailboat. 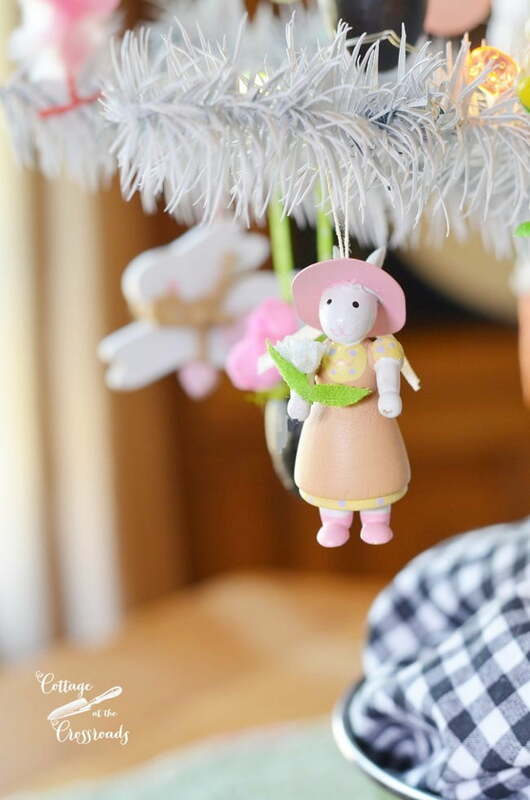 And this wooden bunny wearing her Easter bonnet is another favorite, as well. 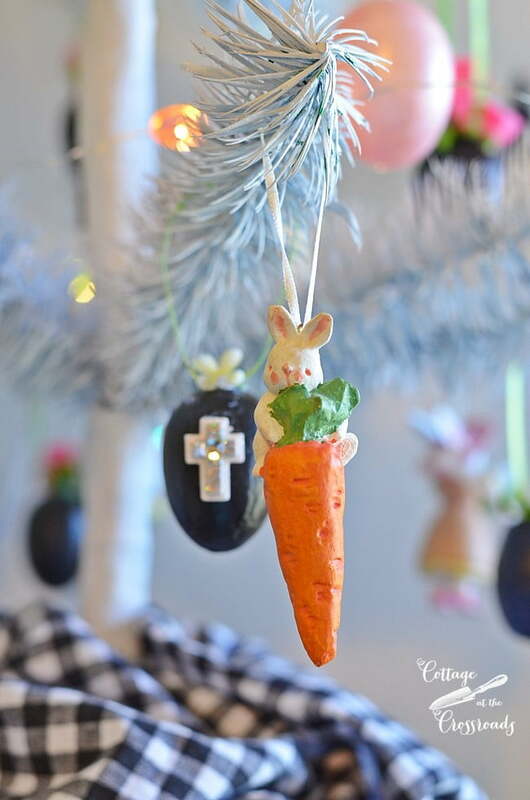 And you just have to have some carrots on an Easter tree, right? 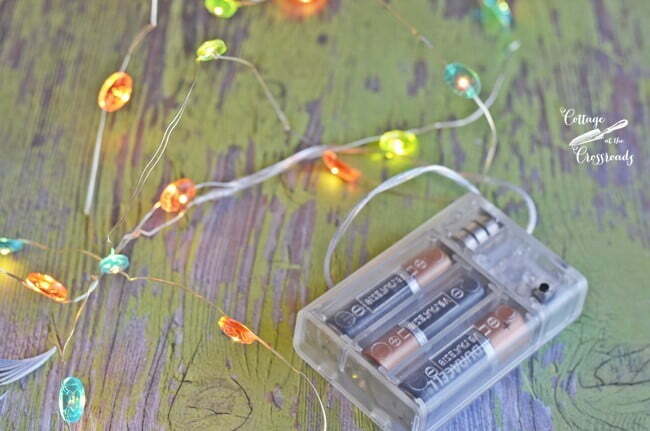 The icing on the cake tree is this set of egg-shaped mini LED lights that I found at Joann’s. They add so much sparkle and shine to the tree. The battery pack is tucked into the little skirt in the colander. You can just barely see the thin cord coming out of the skirt in this photo, and it’s so easy just to reach inside and turn the lights on or off. If you look closely near the bottom of the colander, you can see the floral wire that I used to secure the base of the tree into the colander. It’s in there nice and tight, and I don’t think that the tree is coming out of the colander any time soon. Here is where I have to make a confession. 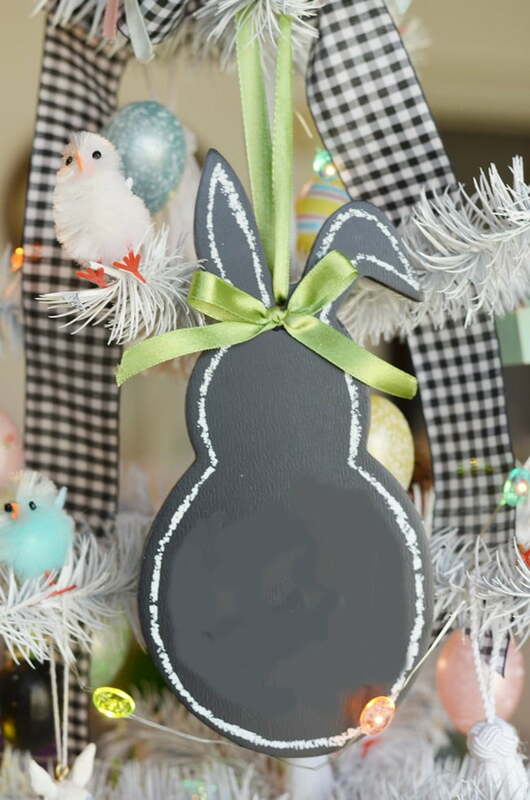 I wrote “Happy Easter” on the bunny chalkboard ornament but it looked so bad that I erased it. So I just used my fancy font to write my message on it! 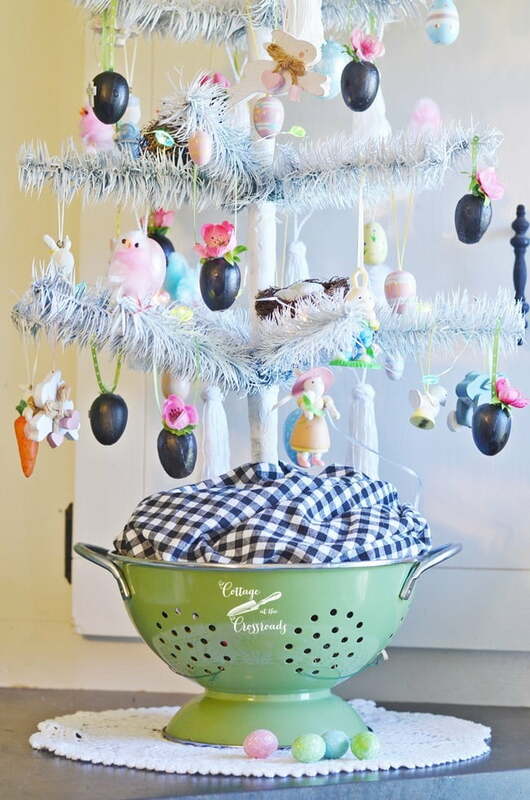 I had lots of fun decorating this Easter tree for our kitchen. 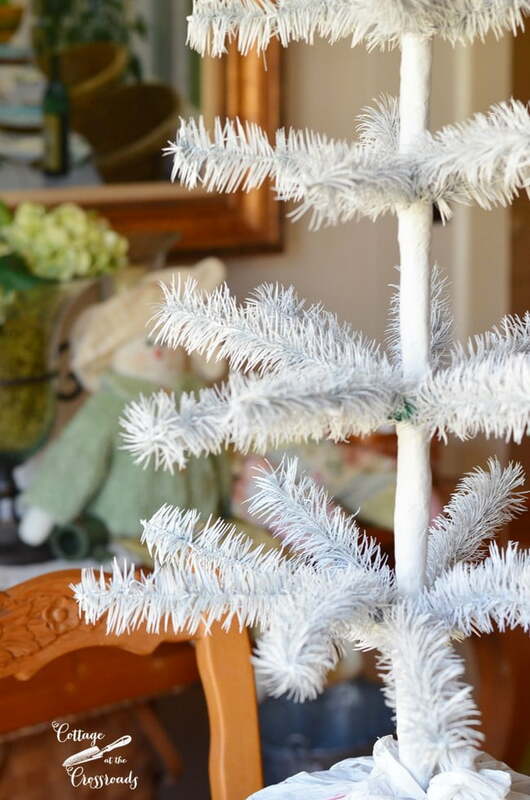 I’m so lucky that I was given my little tree by my friend Brenda last fall, but if you’re looking for a similar type tree, I found this white Feather Tabletop Tree on Amazon (affiliate link) in case you want to create an Easter tree, too. I thought you might like to see how the little tree was decorated for other seasons so I included how it looked last fall and Christmas below. I guess you’ll have to stay tuned to see how it will look this summer! Adorable! I love your tree decorated for each holiday. But I do think it looks better white. I presume you don’t have cats? 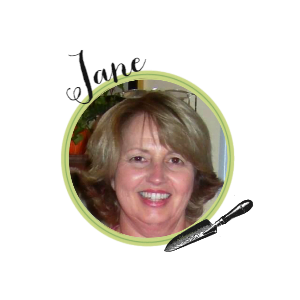 How adorable Jane. I painted a tree white this year too at Christmas and was amazed how much paint it took. I think I like yours white the best and all the tiny ornaments and lights are just perfect for spring. 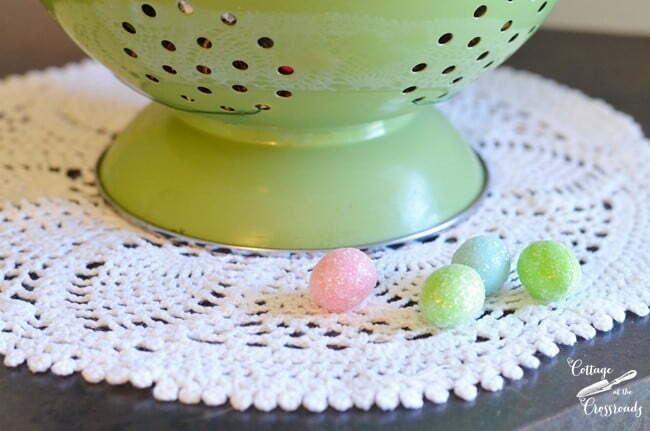 And I can’t overlook the apple green colander that tops it all off. I just found an apple green egg basket today and had to have it. I thought of you when I picked it up. Oh my, I believe I have found a kindred spirit! I have always thought you should be able to come into my home and know exactly what season we were having! Have a great Friday! This is an adorable presentation! Love the colander and the black check fabric and ribbon. I was thinking how I like the black jelly beans when I saw the black eggs. I put up an Easter tree also. We always had one when I was a child so I like keeping the tradition going. Love the little decorations that you’ve owned for so long. Every time I spray paint something I swear it takes 2 or 3 times more than I anticipated it would be! The tree looks great in white. Lucky you to be gardening already. We have melted down here which is awesome for this early in March. Have a great weekend! 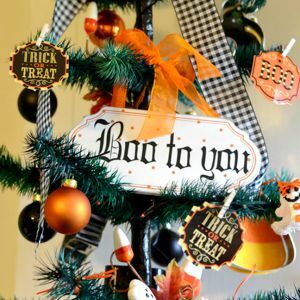 I loved your Halloween and Christmas tree. 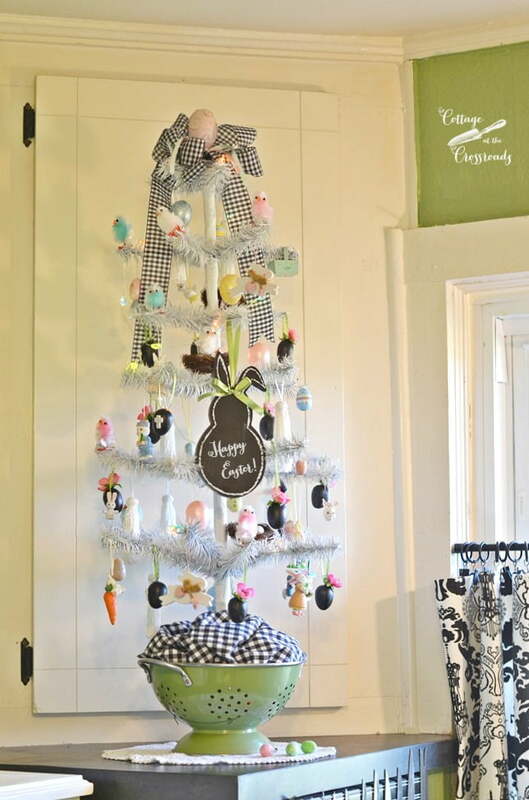 The Easter tree is adorably cute! Looking forward to your Summer tree. That is so cute, Jane all tucked into the black gingham and the green colander.